Mayor Ken Livingstone has urged train companies which operate surface rail services into London to accept pay-as-you-go electronic Oyster cards. Oyster cards are used across London within travel zones one to six and are accepted on Tube trains, buses, trams and Docklands Light Railway network. 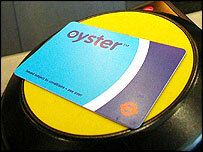 Last May, train operators were offered a £20m package to install Oyster equipment, the mayor said. The train operators have until the end of January to accept the offer. About 180,000 people use surface trains everyday and by not accepting Oyster, the train companies were "depriving" the passengers, Mr Livingstone said. "With the introduction of a zone system for rail fares in London, and my offer to train operators to pay them £20 million to install Oyster equipment, there is no reason why the Train Operating Companies cannot sign up to our proposals by 31 January. "Oyster has already proved itself to many millions of Londoners and it seems amazing that these companies haven't yet agreed to a deal which would meet their capital expenditure and would save their customers time, money and inconvenience," he added. Since their introduction in 2003, 10 million Oyster cards have been issued in London and only 5% of passengers still pay by cash on buses and Tube trains, the mayor said.